After numerous failed attempts at predicting Apple's first foray into television sets, Piper Jaffray analyst Gene Munster has not yet given up hope that the company will deliver. During an interview at Business Insider's 2014 Ignition Conference earlier this month, Munster made yet another prediction on the rumored Apple technology, citing a two-year wait for Apple's own television set. Munster regarded this year's prediction as an "annual penance" for being consistently incorrect in guessing the release date for Apple's rumored television set. Instead of the usual one-year prediction Munster has been throwing out the past few years, the analyst looked into the past to further support his two-year suggestion for Apple's next big product. 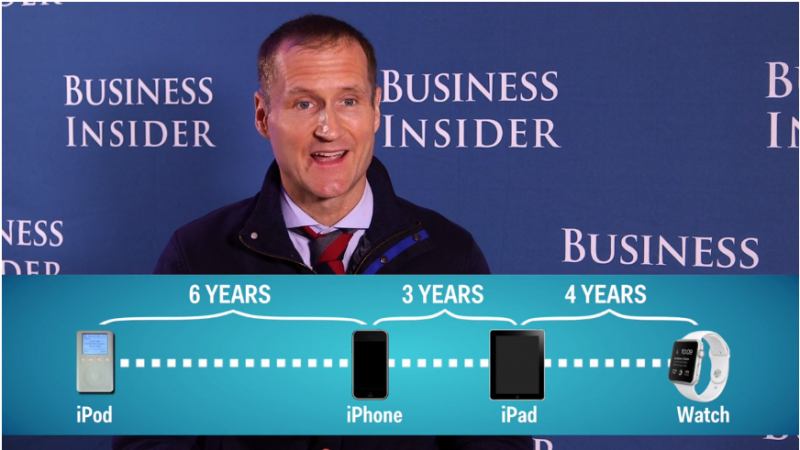 "Apple takes a long time in-between products. If we look back over the last decade, it's 3-6 years between major products. And so, ultimately the Watch is what hit this year, they're gonna refine that next year along with payments. And then that probably gets us into 2016 as more of a time frame for the actual television." Though it may seem a bit behind the game for Apple to launch a television set when connected TVs are already becoming ubiquitous and prices continue to decline, Munster looks at the lack of innovation and the true potential of Apple entering the market as significant positives for the company. "So far the connected TV market really hasn't done much, they sell a lot of units but people don't really use the connected TV part unless they're accessing Netflix. So the concept of what the opportunity can really hold around connected TVs hasn't even been tapped, so they haven't missed out on anything." Business Insider went on to ask Munster about the potential market gains Apple would see if they entered into the television set space. Munster addressed the current plateauing market of around 220 million TVs sold every year, hypothesizing that if Apple captured 10 percent of that market (Apple currently has 20 percent of the smartphone market) it could possibly sell around 22 million TV sets per year. Munster thinks that that market size is "big enough that it could be a 5 or 10 percent addition to the overall size of Apple." Finally, Munster addressed the price of the possible Apple TV set, thinking it could run around $1,500, or "about double a comparable sized TV." Rumors began swirling around an Apple TV set a few years ago, particularly after Steve Jobs himself hinted at a breakthrough in his authorized biography published shortly after his death in late 2011. Rumors have been mostly quiet in recent months, however, as attention has turned away from a TV set or even a revamped set-top box and toward the imminent launch of the Apple Watch. Can we PLEASE just get a box with gaming and iCloud sync for god's sake??? Seriously, how does Amazon beat us to this?? Personally I wouldn't want "smart" hardware integrated into a TV anyway. If we've learned anything... it's that things change waaay too fast. File formats get added, processors get faster, etc. I just want a "dumb" screen and then a cheaper box that I could swap out as needed. Screens don't change very often... but playback hardware certainly does. Apple has had the right idea all these years by making the AppleTV a separate box that you add to whatever TV you happen to have. It's a lower barrier of entry. Sadly... Apple has let the AppleTV languish for a long time. I hope they're working on new and exciting things. And I hope one of those things is gaming. Apple has impressive hardware and a popular app store. And they certainly have developer support. All they need is a nice gaming controller and a new SDK. It wouldn't replace an XBox, Playstation or Wii... but it could certainly add some extra value to the AppleTV. Imagine a $100-150 AppleTV with the iPad's A8X processor and affordable games that you buy right from your couch. Every kid would be shouting for that. And at such a low cost... it would appear in millions of homes. I believe there's a space between $400 consoles with $60 games... and mobile devices and $1 games. Apple has all the pieces to slide into that space... and maybe even dominate it. keep repeating it every year - fail. There's no money in the television business... what could an Apple television do that an Xbox or similar cannot do? There's no way Apple could get the large margins they're used to with a TV set. There will not be an Apple Television in 2016 or 2015 or any other year. It is not going to happen. Ever. I agree with the sentiment already stated before my posting. I want a better Apple TV box. One that has an app store and that does not require a cable subscription to use it. One with an SDK for developers to build apps for and contollers that allow some level of gaming. I dont want a TV. I want a High Def Display in the size of my choice. An integrated TV approach is not what I want. IMHO what I want is actually doable if Apple wanted to do anything. An integrated TV is more complicated and harder to sell. How does this douche boat captain continue to get airtime??? Is this guy for real!? If he keeps saying it for the next 50 years it will likely come true at some point! I really thought he was Al Bundy from Marries with Children.